Make one call for all your dust control, ice control, chemical, and food-based agricultural liquid transport needs. 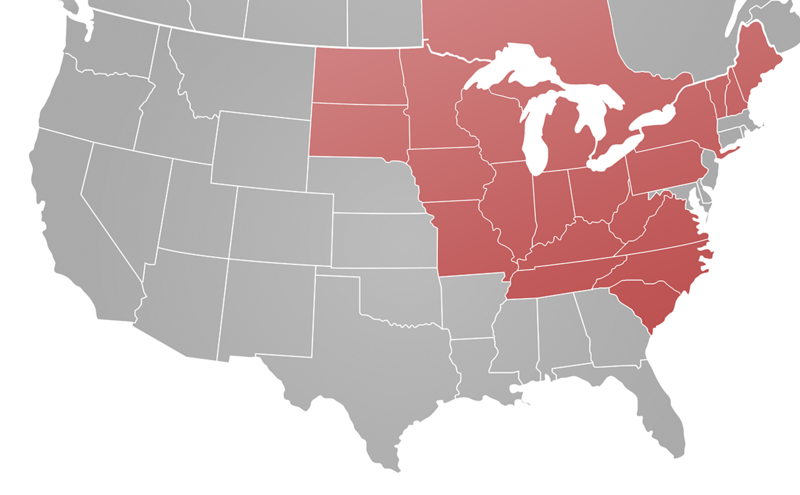 FAST-approved into and out of Canada, we operate within a 700-mile radius of Michigan. Inquire today about our open traffic lanes! We currently serve a 700-mile radius from our Headquarters in Michigan. MBH Trucking and Chloride Solutions Dust Control applies product to residential and commercial driveways, parking lots, county roads, parks and horse arenas. Delivery is available to customers purchasing our Liquid Calcium Chloride Brine for ice and snow removal and anti-icing. Totes and drums and gallon containers are available for pickup or delivery We ship from Michigan to the U.S. and Canada. We regulary deliver to the following locations: Michigan, Ohio, Illinois, Indiana, Wisconsin, Kentucky, Tennessee, North Carolina, South Carolina, Virginia, West Virginia, Pennsylvania, New York, Maine, Iowa, Missouri, Minnesota, South Dakota, North Dakota, Ontario. News 10 has asked the state if they have considered using Geo Melt 55. Chloride Solutions manufactures and distributes a product called Geo Melt-55. A beet-based product used with chloride and salt to make the roads safer. The company said this product has a higher sugar content than most liquid de-ice. "The sugar allows the freezing point to be lowered and stay at that point, even in the delusion of melting the ice and snow," said Barczak. According to experts, salt, when used on the road, can create more ice because when the salt dilutes the ice it creates water and freezes again. Chloride Solutions said their product does not do that and works in temps that are as low negative 30 degrees Fahrenheit. Road crews in Farmington Hills are getting ready for the snow that's expected to fall this weekend around metro Detroit. Not only do the crews use salt, but they use a liquid solution made up of salt brine and beet juice. They've been doing it since 2005. Contact us today regarding a quote.